Welcome to the Jungle! You’re not in a tropical destination but at Paul Brown Stadium along the Ohio River, home of the Cincinnati Bengals. You’ll hear this famous song by Guns N’ Roses when the Bengals take the field and the roar of a Bengal in this stadium nicknamed, “The Jungle.” Paul Brown Stadium is located in downtown Cincinnati and part of the city’s riverfront development that includes Great American Ball Park, home of the Cincinnati Reds (MLB). Both teams sought new stadiums in the 1990s to replace the multipurpose Riverfront Stadium. In the early 1990s, Bengals owner Mike Brown suggested that Riverfront Stadium was becoming an obsolete NFL stadium because it lacked an adequate amount of luxury suites and other amenities. Over the next several years, Brown struggled to gain support for a new stadium for the Bengals. Rumors began to swirl that the team might move to either Baltimore, Cleveland, Los Angeles or Lexington, KY. However, in 1996 Hamilton County voters approved a referendum allowing a new stadium to be built. Constructed just blocks away from Riverfront Stadium, groundbreaking ceremonies occurred on April 25, 1998. Contrary to most other teams in the NFL, the Bengals decided not to sell the naming rights to the stadium. Instead they honored their team founder, Paul Brown, and named the stadium, Paul Brown Stadium. The Bengals inaugural first game at Paul Brown Stadium was on September 10, 2000. The stadium’s exterior has a sleek futuristic architectural design. 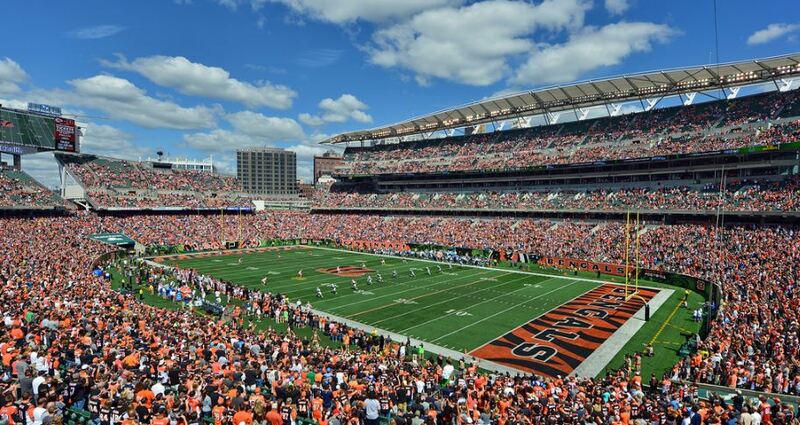 Inside, over 65,000 green seats are located throughout Paul Brown Stadium. The lower deck circles the entire playing field. A club level and upper deck are also located on both sides of the field. An additional second deck of seats is located beyond the north end zone. There are video/scoreboards located above the seats in the south and north end zones. Paul Brown Stadium has several amenities including 144 luxury suites, over 7,000 club seats, two club restaurants and a Bengals team store. Fans attending games at Paul Brown Stadium can see beautiful views of the Cincinnati skyline and the Ohio River. As a result of ongoing turf problems with the grass field at Paul Brown Stadium, the Bengals replaced the surface with FieldTurf after the 2003 season. New for the 2015 season is a new bar at the east end of the stadium and new concessions stands around the facility. The biggest improvement at Paul Brown Stadium is the new video/scoreboard. It is 40% larger than the existing one, ensuring fans will not miss any replays. Although the Bengals were once one of the worst teams in the NFL and failed to sell out many of their games, they now compete for playoff berths on a year basis.